Having small bathroom suites doesn't mean you have to compromise on their style, there are plenty of bathroom products out there specifically designed to maximise and make the most out of your space. A great example of this is the beautiful Marseille Corner Toilet & Soft Close Toilet Seat from Ceramica. 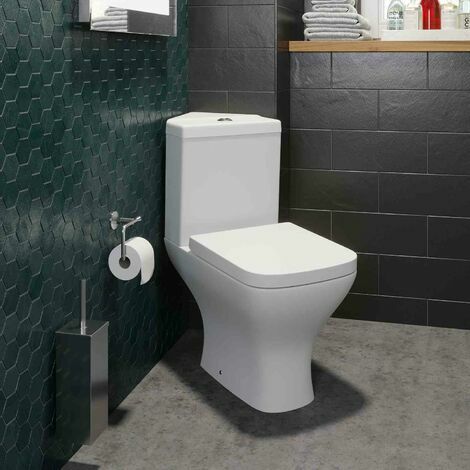 The Marseille Corner Toilet is a stylish and modern space saving product, constructed from ceramic using the highest manufacturing techniques, bringing you a durability and robustness which is guaranteed to last a lifetime. It's finished in a crisp white gloss too, which will blend in with any bathroom style. On top of the cistern, you will find a contemporary push button. This will help you to save water with it's choice of two volume flushes – a smaller 4 litre flush or a larger 6 litre flush depending on what is needed. You might be able to reduce your water usage by 27%, saving you money on your water bills which is never a bad thing! This Marseille toilet also comes complete with a matching white soft close toilet seat, meaning if it's accidentally dropped in the middle of the night you wont wake up the whole house or damage the pan. If this wasn't enough the toilet is of course CE and WRAS approved while also being covered by a fantastic 10 year guarantee on the ceramic and a 2 year guarantee on the toilet seat for added reassurance.